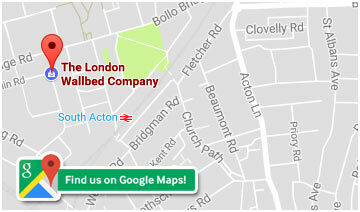 The London Wallbed Company is committed to quality service. With this in mind, we’ve made it easier than ever for you to get answers to your questions. If you can’t find your answer from these Frequently Asked Questions, please call us or email us from our contact page. 90cm – 120cm – 140cm – 160cm – 180cm mattress widths. The cabinets can vary in size. We can provide vertical or horizontal wallbeds, in 35 different finishes. A single CuBed is £895, a Double £995 + delivery charge. A wallbed in a cabinet starts at £1816 for a single, £2303 for a Double & £2625 for a king size + delivery/installation & mattress. Yes and No – models vary between 15 and 18 cms mattress thickness – we would need to ask you further information regarding your mattress. We have a large range of mattresses available, from coil sprung, water latex through to handmade. We also stock Memory Foam. How heavy are your wallbeds to open or close? On most models – No. The cabinets are only 45cm deep, so it really does depend on your duvet and pillows thickness. Let us help, with our free design service – our Mix and Space ranges have many home office elements. Please contact the showroom and we can advise. It depends on the model but between 4 to 10 weeks. Installation is extra – subject to location. One of our ranges can be DIY, if you have the correct equipment and assembly skill. See our Self Assembly page for more information. The wallbed mechanism is guaranteed for 5 years. Yes but only on quantity ordering. Yes, we can supply wallbeds almost anywhere.